Well, I do not know anything about the F3S radio but was wondering if it used the same battery design as the T-8 Tri-Bander that ICOM makes? The T-8 has been selling like wild fire and the batteries have been breaking just as fast! The battery has a spring plastic tab that holds the battery on the back of the transceiver. It's a good idea in that there are no tools required to remove the battery but - after flexing a few times it BREAKS! This renders the battery and the radio useless. "There are two problems with the design of the battery pack that effect the performance of the snap. The material appears to be either talc or fiber filled which will increase the impact strength of the material, but will also decrease the materials flexibility. The second issue is that the snap geometry itself is flawed. A well designed snap wing should be tapered in thickness so that the strain is evenly distributed along its length." "In the case of the ICOM battery snap the strain is concentrated at the base of the snap in the U shaped area. It can be seen that the outer fibers of the U are strained past the materials allowable limit even under normal operation of the snap. Two solutions are available, change the material of the battery pack, or change the geometry of the snap." As of this time ICOM has shown no willingness to redesign the batter retaining tab, nor have they given any indication that they are going to change the type of plastic used in the manufacturing process. They have yet to acknowledge that there may be a problem with the T-8 batteries. As of this time ICOM is replacing batteries that fail while under warranty. 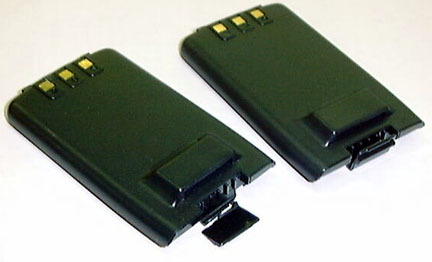 If you have a broken battery contact ICOM America via e-mail or phone 425-454-8155 or FAX 425-454-1509 for a replacement. On November 25 I received e-mail from William Chueh of Maha Communications. Mr. Chueh states that his company now has two battery packs available to replace the ICOM packs. He went on to say that they have solved the problem with an ABS material and a REDESIGN of the battery tab. You can see a copy of Mr. Chueh's e-mail by clicking here. On Saturday, 12/05/98 I stopped at AES in Wickliffe Ohio. I checked out the MAHA batteries. I am now able to confirm what William Chueh had told me. "The MAHA batteries appear to have solved the tab-breaking problem." As soon as you touch the tab you will notice the difference. I believe they should provide a long and useful life. This coupled with the excellent reputation of MAHA in customer satisfaction will make ICOM's T-8 a good radio. ICOM should contract with MAHA for batteries and perhaps chargers as well. I know it sounds like a commercial but I do not work for MAHA and in fact do not own any of their products! Oh well, enough said, I enjoyed the trip had good conversation with Ben, AA8AH and John, WA8PKB. Brought back memories of the old days when Pete Smith (God rest his soul) was the manager. Wow! Guess I'm getting old.